Many people have never heard of myYearbook, a social network that skews pretty young (half of its members are teenagers). But it’s got a substantial audience, with around 55.7 million visits and 4.3 million uniques a month, according to comScore. And recently, it’s been growing very quickly — according to comScore, unique visits are up 23% since last November, and page views are up a whopping 83% over the same time frame, to 998 million. Earlier this week, I sat down with CEO Geoff Cook to talk about what’s driving the growth. The key, Cook says, is a feature that launched in November called Chatter (which has no relation to the Salesforce feature by the same name). Chatter is a lot like Facebook’s News Feed — it’s a stream of content recently posted by other users on the network. But unlike Facebook, which populates your feed with items from your friends, Chatter is geared more towards meeting and interacting with people you don’t know. Cook says one contributor to the feature’s popularity is the fact that you can filter what type of items you’re seeing — for example, I could elect to see only content posted by women aged 20-30 (for this reason, the site has a more flirty nature than what you’ll find on Facebook). That’s helped the feature catch on, and Chatter is now seeing 1 million user updates a day. To help boost engagement, myYearbook has borrowed features popular on other sites and incorporated them into Chatter. First, the site added Ask Me, which is a Q&A feature very similar to Formspring.me. It then added ‘Rate Me’, which lets you post a photo and have it rated by strangers (which sounds like a recipe for low self esteem, but Cook claims that people receive quite a few ’10’s). The site also plans to add a feature called ‘2 Truths & A Lie’, which is an online version of the classic game. 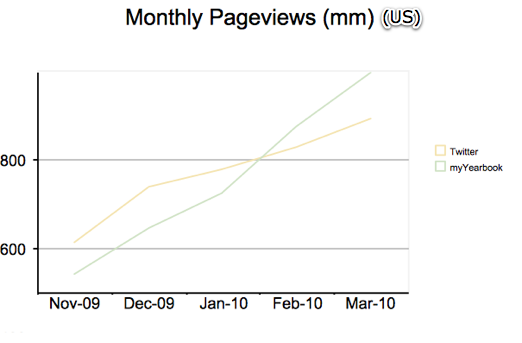 Some of the site’s growth — the boost in unique users, in particular — is likely due to the fact that myYearbook now syndicates Chatter updates to Twitter, which direct users back to the site. But he says the rise in engagement (page views have jumped from 544 million in November to 998 million in March) is primarily from users interacting more with the site, and it’s driven by Chatter, along with the site’s redesign. Cook also points out that according to comScore, myYearbook has more page views than Twitter.com does in the United States (though he concedes that much of Twitter’s traffic comes from third party clients, and Twitter has a large international audience). Looking forward, Cook says that the company will soon be launching applications for both the iPhone and Android.